Featuring Abbas Akhavan, Morehshin Allahyari, Amir Bastan, Bahar Behbahani, Kaya Behkalam & Azin Feizabadi, Barbad Golshiri, Arash Fayez, Mirak Jamal, Farhad Kalantary, SohrabKashani, Gelare Khoshgozaran, Amitis Motevalli, Nosrat Nosratian, Anahita Razmi, Jinoos Taghizadeh, Negar Tahsili, and Katayoun Vaziri. As meanings transition from one context to another, they resonate in the present as well as in the historical discourse. 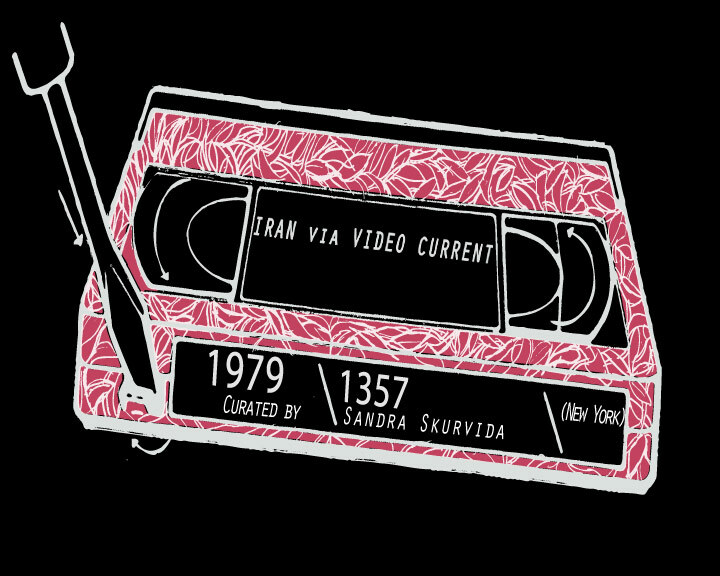 In her program entitled 1979/1357, Sandra Skurvida revisits the sightlines of the most prominent and controversial Western observer of the Iranian Revolution, Michel Foucault, and his reportage on the founding event of the present state of Iran. His invocation of “a political spirituality” conferred to the Islamic revolutionary forces during the events unfolding in Iran from November 1978 through February 1979 extends to the events that were set in motion by the Arab Spring and presages the new governmental formations following the uprisings; first in Tunisia and Egypt, and soon elsewhere around the Persian Gulf. In the Islamic governance, Foucault had envisioned “technologies of the self” that would provide the foundation for the new form of spirituality in resistance to power. He hailed the innovative uses of radio, cassettes, and telephone by the Islamist revolutionaries (in advance of the Internet-driven social media that played a crucial role in the recent uprisings) — he hails this blending of traditional religious discourses with cutting-edge technologies that had helped galvanize the movement and ultimately defeat the Pahlavi regime with its very own, modern “Westoxic” means. Foucault’s theoretical apotheosis has been met with sharp critique in the West, particularly from the Left — these debates gain currency yet again, as societies in Tunisia, Egypt, Libya, Bahrain, and Syria are reshaping themselves, and the outcomes are far from certain. This historical resonance, interlaced with video footage representing “Iran” from Iran as well as from Norway, Germany, Canada, the US, and elsewhere, may provide a discursive framework for these changes, which testify that Europe and the “West” are quickly fading from the world memory map — to paraphrase Wallid Moallem of Syria, “We will forget that Europe is on the map and we will look east, south and toward every hand that is extended to us. The world is not just made up of Europe.” On the other hand, historical discourse provides only a safety net to stave off the trauma of the unknown and the unintelligible. Delivery of unintelligibility via video art makes it perhaps more tolerable? The artists provide their own varied responses to this curatorial premise, depart from it, and transcend it.